Counterweight included, where applicable, to meet ANSI/BIFMA requirements. Three-part, telescoping, steel ball bearing suspension for smooth drawer operation. 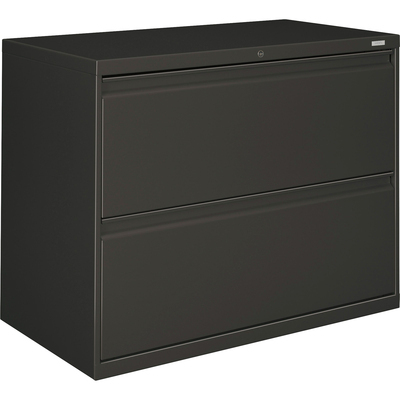 Drawers include side-to-side hangrails for letter or legal size filing, a full-width radius-style pull and magnetic label holder. Mechanical interlock allows only one drawer to be open at a time to inhibit tipping. Four adjustable leveling glides help compensate for uneven flooring. HON® "One Key" interchangeable core removable locks. Three-part, telescoping, steel ball bearing suspension for smooth drawer operation. Drawers include side-to-side hangrails for letter or legal size filing, a full-width radius-style pull and magnetic label holder. Mechanical interlock allows only one drawer to be open at a time. Four adjustable leveling glides help compensate for uneven flooring. HON® "One Key" interchangeable core removable locks.